Robust and mobile sack holders feature in our Classic range. Designed to improve efficiency and handling of heavy sacks of mail or packages. Each of the range of Classic Sack Holders accommodates Royal Mail sacks and most standard sizes of sack. Sack suspension hooks are tucked neatly under the frame to avoid injury or snagging and yet are easy to access, and arranged so that sacks can be changed independently. 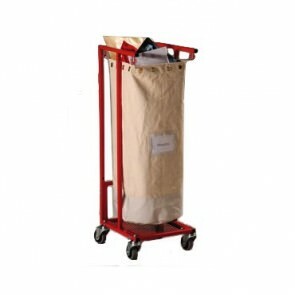 The Classic Sack Holders are mobile on 4 heavy duty castors allowing for easier manual handling and manoeuvrability. Available as standard in a variety of sack configurations to suit any requirement; Single, Double, Triple and Four-in-line, but other combinations are possible. Depth: Single 400mm, (Back-to-back Double-depth option: 800mm) Width: Single 356mm, Double 693mm, Triple 1030mm or Four in line 1367mm. Hook Centres: 336mm x 330mm. Frame: Fabricated from 19mm x 19mm x 1.6mm mild steel tube and punched 1.6mm mild steel sheet, bolted together to suit the selected configuration. Castors: Heavy duty swivel castors of 75mm diameter, fixed with M10 high tensile zinc-plated socket-head bolts directly to the frame. Epoxy powder coated ‘Post box’ red.